A light body lotion fragranced with White Musk Smoky Rose, a blend of cruelty-free musk, tobacco flower and notes of black rose. This body wash will cleanse and fragrance your skin with an elegant fusion of bergamot, pink pepper and blackcurrant, before rising to a floral-musky heart. Sensual, Seductive, Floral Musk. Layer with other White Musk Smoky Rose products to build the fragrance. I’ll be honest, I only got this because it had Rose in its name and despite the fact that I can’t stand most floral scents, I do, in fact, enjoy the sweet, clean, powder-y scent of roses. I did give both of these a sniff in-store but my nose was completely burnt out by then, meaning I couldn’t really tell if they smelled nice or not… so I got them anyway. I mean… if you name a line Smoky Rose, I’m definitely going to give it a try. The dark berry packaging (kinda’ vampy, kinda’ goth) didn’t hurt, either. In my mind, the dark packaging sorta’ played up to the whole Smoky Rose theme (so if that’s what you guys were going for, mission accomplished). For some reason (probably the name Smoky Rose), I just assumed that this stuff would be in the same scent family (gourmand mixed in with some wood notes) as my beloved Twilight Woods (reviewed here and repurchased on and off ever since) from Bath & Body Works, with a generous helping of powder-y notes (aka rose). Spoiler Alert; it’s not. I decided to get both the Shower Gel and Body Lotion for layering purposes (to intensify the scent). The Body Lotion was alright but the Shower Gel smelled absolutely vile! 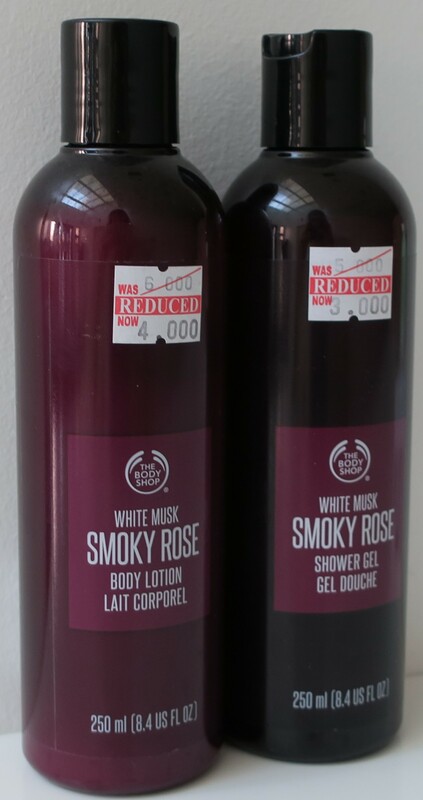 In fact, the scent of the White Musk Smoky Rose Shower Gel is akin to eye-watering fumes of ethanol (even the liquid inside is clear, despite the dark packaging), which is why I just can’t bring myself to use it. Every time I’m in the shower, I’ll reach for this stuff, give it a sniff, wrinkle my nose in disgust, set it back, and reach for something else (that smells better) instead, vowing to use the White Musk Smoky Rose Shower Gel the next time (but I never do, because it smells like straight up alcohol). Eventually, I did man up and try it. First of all, my Riffi Exfoliating Loofah “Massage Strap” (reviewed here) basically just drank this stuff up. It’s never done that before with any of my other shower gels, including the Frosted Plum Shower Gel (hauled here) which was also from The Body Shop and also happened to have somewhat similar packaging. I’m not sure if it’s because this stuff is sulfate-free but it took some elbow grease, and a bit longer than I would’ve liked, just to get a good lather going (I’m used to Bath & Body Works Shower Gels which lather up instantly with very minimal effort). However, with this stuff, I had to squeeze it onto my loofah in very, very small increments, lathering it up as I went along; squeeze, lather, squeeze, lather, until the entire loofah was sufficiently frothy. Also, I prefer something that would effectively strip my skin of… well… everything (moisture included lawl) and this stuff just didn’t cut it. I felt that this stuff was way too gentle (for my taste) and I just didn’t feel clean afterwards. Worst of all, was the horrible, horrible scent! It legit smelled like B.O. (not unlike the Nivea Powder Touch Anti-Perspirant reviewed here). This stuff smelled so bad that I had to use another scented shower gel, immediately after, just to get its stench off me! I’m starting to think that not all powder-y scents are created equal, because some of them straight up smell like… stank. In comparison, the scent of the White Musk Smoky Rose Body Lotion is much nicer! Key word; in comparison. It’s a blatantly oriental floral scent, which again, isn’t exactly my cup of tea. However, I do see this layering nicely with Oud or Teeb because I get that traditional Arab-scent vibe from this stuff (only the Body Lotion though, not the Shower Gel) with random whiffs of Henna, of all things. I don’t love it but I don’t hate it either. Basically, I’m saying, I can work with this, especially during Winter-time. That said, the consistency of the lotion itself is quite strange. It’s not particularly hydrating (in fact, my skin felt bone-dry) and yet it made my skin feel quite soft. Ok, I think I’ve placed it. Basically, the consistency of this stuff is similar to those Gel Lotions (reviewed here) minus the sticky dry-down! Seriously, the White Musk Smoky Rose Body Lotion has zero greasiness, even when you first apply it. Very strange… In any case, like I said earlier, I feel like this will layer nicely with traditionally Arab fragrances, Oud scents, etc… In fact, I think I’m going to start pairing this with my Velvet Teddy Fragrance from MAC (hauled here). Indulge in a holistic sensorial experience; specifically formulated to be applied on the face but also on the neck and decollete, this fresh jellied yet cushiony and ultra-nourishing cream effortlessly melts onto the skin, leaving a light comfortable finish with no sticky residue. I love all things Korean and Japanese! As such, I found the concept of a “sleeping cream” highly intriguing. I mean essentially it’s just a face moisturizer that you apply at night and… well… go to sleep lol but for whatever reason, I find that the whole concept of a “sleeping cream” not only interesting but fun! I’ve tried my hand at Origins High Potency Night-A-Mins mineral-enriched moisture cream (and gone through several jars of the stuff actually) and used it as a “sleeping cream”, but that was mostly because it smelled really nice (like oranges or something equally citrus-y) and had a cute name (Night-A-Mins kinda’ like Vitamins, cute, no?) but I’ve been dying to try the Garnier Miracle Anti-Fatigue Sleeping Cream (the one that comes in indigo-blue packaging) since 2-3 years ago, but still haven’t managed to find it anywhere in the country (give it a few more years and eventually it’ll turn up because that’s Kuwait for you, always a step… or ten, behind). So I was pretty stoked when I stumbled upon this Oils of Life Sleeping Cream chilling all nonchalant on the large table in the middle of The Body Shop just waiting for me to take it home. I mean… just read the description, “holistic sensorial experience” (no clue where to even begin to understand what that means… but I’m in! ), “jellied” and “cushiony” (both keywords I’m instantly drawn to) and finally “no sticky residue” (hallelujah!). It’s all so very… me. Thank you, Egypt, Chile, and China for being a part of this. See what happens when we all come together and join hands? Great things happen, that’s what (yeah so it’s past midnight and I’m kinda’ getting delirious so bear with me). 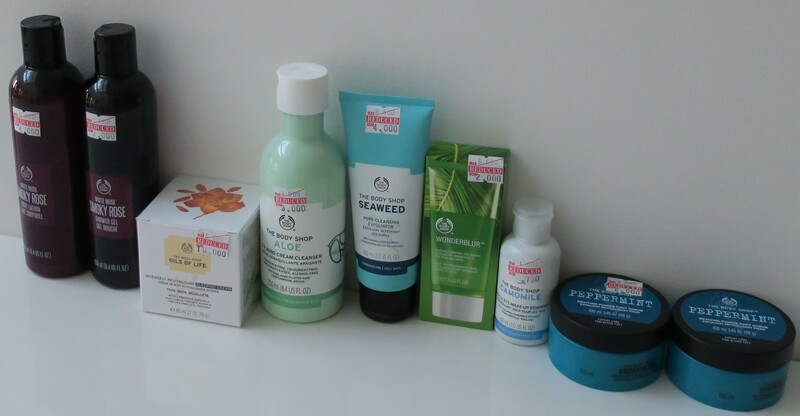 I know I just hauled some face creams The Body Shop Vitamin E – Aqua Boost Sorbet (here), Swiss Line Aqua-Vitale Gel-Cream (here), and some samples of the Lancome Energie de Vie Liquid Care Moisturizer (here). However, this stuff is actually marketed as a sleeping cream… which means it is different! This particular sleeping cream happens to be from the Oils of Life range, and I’ve never tried anything from that line before, so I’m pretty excited about that too! This stuff comes in a glass jar, which aside from looking aesthetically appealing, also adds substantial weight to the product, which I really appreciate. Lighter products tend to feel flimsy and cheap and by that same token, heavier products come across as more durable and expensive. I also like the yellow-orange (jar) on black (twist-off cap) because the whole thing looks like… skincare that means some serious bidness! It looks bougie enough to display on my vanity table. It smells lovely as well! It kinda’ reminds me of the push-pull technology actually (mentioned in my review of the Lady Gaga Fame Black Fluid Perfume). I keep getting random whiffs of each of the essential oils in turn, one second it’ll be something powder-y and clean, the next minute it’ll be something vix-like (ugh! I think Marjoram Leaf is the culprit… legit reminds of me Tiger Balm or Vix VapoRub), shortly after it’ll be something delightfully citrus-y, and so on. That said, all the scents are pretty subtle and inoffensive (except for the VapoRub one) and together, the overall scent comes across as quite pleasant. Basically, it smells like Shampoo. Instantly: skin feels suppler and velvet-y soft. From 1st wake up: skin feels smoother and intensely nourished. Night after night: skin appears rested, more radiant, and visibly revitalised. As soon as I opened the jar (and removed the protective plastic tab inside), I was delighted to find that this stuff was all whipped and mousse-y (lovely consistency), like some sort of lemon-y dessert! In fact, I was pretty tempted to give it a taste! For the record, this stuff actually tastes sweet! It’s not what you think lol I don’t tend to eat my skincare… generally. It’s just that when I applied this stuff to my face, some of it ended up on my lips, and I may (or may not) have licked it off of them, out of curiosity (don’t judge). Basically, this stuff looked great, smelled great and tasted great, but the question was, how did it perform? Well, the first time I applied it, I sorta’ slathered a lot (like, a lot!) on my face. As promised, my face felt supple and soft, instantly. However, it also made me feel like my face was all sweaty, which was surprising because that’s a trait commonly found with other more heavier, richer moisturizers, whereas this stuff was pretty light-weight. It made my face feel greasy, which in turn, made me anxious about going to bed (because I knew this stuff was going to get smeared all over my pillows). Not wanting to kick my OCD into high gear, I stayed up later than usual, hoping that by the time I got into bed, this stuff would’ve already absorbed into my skin. No such luck. A few hours later, I could still feel this stuff sorta’ just sitting on top of skin (not being fully absorbed). Eventually, I passed out and woke up to super soft skin… but my face still felt a smidge greasy. I washed my face with cold water and a mild cleanser (that I’m currently testing out) and applied my makeup, only to find that my makeup applied like a dream! Everything went on so perfectly and smoothly! During my second attempt with this sleeping cream, I applied much, much less than I did the first time. The result was still the same. I could physically feel it just sitting on top of my skin (without fully absorbing into it), which made my face feel all sweaty (so uncomfortable) and overall greasy. For my third attempt, I actually read the directions first before applying anything on. Apparently, you were supposed to actually “massage” the sleeping cream into your skin (face, neck, decollete) for it to be absorbed, otherwise it would just sit there, over-top (well, derrr). Duh-moment over, I massaged this stuff on to my skin and hey presto, no more sweaty-face (or accompanying greasiness)! I could hop into bed five minutes later, and not have to worry about this stuff smearing all over my pillows! Best of all, I get to wake up to super soft skin! Appearance-wise, I’ll notice a difference as soon as I apply this stuff on, because my face will be all glow-y and radiant, pretty much instantly. Generally, I don’t tend to notice these things, but when my immediate family and a handful of coworkers (people who see me every single day) pointed it out (commented on my skin looking “radiant”), I started noticing. So far, I’ve really been enjoying this Oils of Life Sleeping Cream because I love what it’s been doing to, and for, my skin! I’ve always loved Bath & Body Work’s Cucumber range (here) and found their take on it (fresh and sweet) absolutely delightful! So, when I spotted this stuff looking all adorable in its old-timey milk-bottle packaging, with what appears to be Cucumber Slices depicted on it, and read that it was a Cream Cleanser (barely glanced at what it said really), I grabbed it and tossed it in with the rest of my stuff (to-buy). I’m a huge fan of Cream Cleansers for makeup removal (quick and effortless), and although I’ve already found my Holy Grail Makeup Remover (reviewed here), I’ve ran out of it (on several occasions) and couldn’t find it in stores (out of stock), and had a really hard time finding something similar (on such short notice). That’s why I now make it a point to try out different Cream Cleansers every now and then. I’m always on the lookout for a good substitute, just in case. However, what appeared to be Cucumber Slices on the packaging, actually happens to be Aloe (sneaky little hobbitses!). Whatever happened to the universally known depiction (kinda’ star-shaped with long stems that have little spikes all over them) of Aloe? I guess that’s what pure, hand-filleted Aloe (like chicken fillet?) from Campeche, Mexico looks like. I’m not bothered though because Aloe is good too, maybe even better than Cucumber. I mean they’re both beneficial to the skin… and stuff, right? Plus, the main objective was to find a substitute for my beloved Clean & Clear Deep Cleansing Makeup Remover. Focus, LuLu, focus. Seaweed Pore-Cleansing Exfoliator is my new favorite face scrub!!!! Honestly, I was only browsing through the Seaweed range because I was hoping to find the Seaweed Purifying Facial Cleanser (reviewed here) which was actually a pretty good dupe for my Clean & Clear Deep Cleansing Makeup Remover (reviewed here). Unfortunately, I couldn’t find it. I did however find this Seaweed Pore-Cleansing Exfoliator with mineral-rich Seaweed from Roaring Water Bay, Ireland. You had me at Seaweed, guys. As I’ve stated many times before on this blog, I’ll try anything with the word “sea” in it, including but not limited to; seaweed, sea kelp, sea salt, sea water, heck, even sea foam. Plus, I love all forms of exfoliation (but physical exfoliants especially) so I’m always down to try out a new one. I wasn’t expecting much really. However, I was veritably blown away! This stuff was awesome! It ticked all the right boxes for me! It actually reminded me very strongly of my beloved L’Oreal Gel Wash from way back when (mentioned in great detail, here), down to the scent! It might not smell the greatest but I find the scent… nostalgic (because it reminded of the L’Oreal Gel Wash… as I just said). Its performance however, is nothing short of stellar! Move over MAC Mineralize Volcanic Ash Exfoliator (reviewed here), I’ve found a new favorite! As opposed to those tiny plastic beads (found in most exfoliating products) this stuff has got tiny little olive stones, which are effectively the same, without being harmful to the environment. This stuff is nice and gritty, exfoliates my face evenly, all without drying out my skin! Within seconds of using this stuff, I felt that my skin could finally “breathe”! I’m not sure what to call that sensation, where your skin feels ultra clean, a bit lighter (less heavy than before using the scrub), and slightly tingly, so I just refer to it as breathing. At first, I thought it was just my imagination, but this stuff really did clear out my pores too (most noticeably in the nose area). As an added bonus, it’s nowhere near as messy as the MAC Volcanic Ash Exfoliator which was black and as such, always created a huge mess in my bathroom (either at the sink or shower) which I found super annoying. I just love the way this stuff exfoliates my face! I don’t wanna’ jinx it but the Seaweed Pore-Cleansing Exfoliator might very well be Holy Grail material! If not, it’s definitely my new favorite face scrub! I’ve always believed that primers are effectively useless. However, I still get suckered into buying them (I think I’ve purchased every single primer known to man, at this point) even though I never use them. The only one I used religiously was my first one, Dr Brandt Pores No More from way back in the day (based on a rave review from Allure magazine, which should show you how far back we’re talking), before concluding that primers are useless. This time, my reasoning for purchasing this particular primer was the price (I thought it was a steal) and also because I haven’t tried anything from the Drops of Youth line before. I don’t use foundation, ever, but I do use other face stuff (namely MAC Mineralize Skinfinish) so I figured I should get my money’s worth (all 2 kd lol) and give this stuff a try. I’ve only used it once so far, but it smelled delightfully citrus-y, which was a very pleasant surprise! As for its performance, I can’t attest to that because I’ve only used it once, as I said, but it was sufficiently silicone-y and primer-y… dunno’ what else to say lol I’m more excited about the scent, honestly. Melt away eye makeup around the eyes with our Camomile Gentle Eye Makeup Remover. Our Camomile eye makeup remover gently cleanses, leaving the skin smooth and clean. This was a repurchase. I didn’t get along with it, the first time around (reviewed here), but I’m willing to give it a second chance. I picked it up, last minute, at the check-out counter because it was tiny (cute!) and cheap (reduced to less than 1 Kuwaiti Dinar). Buff your feet beautiful with our fresh and cooling peppermint essential oil foot scrub. With exfoliating volcanic rock granules, use this foot scrub to slough away hard skin, revealing silky-smooth results. This was another repurchase. I’ve actually been repurchasing this particular foot scrub, for years and years! Generally, I find it boring and unoriginal that most foot products tend to smell like peppermint. However, I not only appreciate, but also actually enjoy the peppermint scent on this stuff! It smells all nice and minty, like Wrigley’s Extra Sugar Free Gum… or toothpaste. It’s kind of hard to describe the consistency of this stuff, but I’ll give it a go anyway. It’s soft and squishy (almost sponge-like to the touch), while also being very, very gritty (pumice is actually listed second on the ingredients list, aqua being first). Using this dry, is kinda’ like rubbing slightly damp sand (and not the powder-soft kind, either), onto your skin. Using this wet, is when the magic happens! With very little water, this stuff foams up instantly! In fact, I’d even say that the amount of foam is disproportionate in comparison with the amount of scrub being used (like, where is all this foam coming from?) which I find delightful! Basically, it means a little goes a long way. Like I mentioned earlier, this stuff is very gritty! Unlike most scrubs, this stuff has an extremely generous helping of scrubby bits suspended in the gel. So whether you use this wet or dry, you’re gonna’ get some pretty decent exfoliation action going! The final step in my shower routine is foot care. Generally, I’ll use any ol’ Foot Scrub in conjunction with a Pumice Sponge (hauled here and here) before finishing off with my Diamancel #11 Foot Buffer (reviewed here) all while doing a flamingo imitation (balancing on one foot). However, with this Peppermint Foot Scrub, I’ll sorta’ rub it all over one foot and just revel in the sensation (for a sec), because it legit feels ah-mazing! It’s like getting a mini foot massage or something, because it just feels that good, and I’m not even a massage person (I don’t get massages regularly) let alone a foot massages, but this stuff is awesome! You’ve gotta’ try it, to understand what I’m talking about. It’s especially soothing when I’ve had my feet shoved in boots all day, or after a good workout sesh at the gym (LOL, as if), or if I’ve been wearing back-breaking heels for an event, so I don’t believe this foot scrub is season-specific (meaning it’s pretty handy during both Summer or Winter). If I could describe the sensation of rubbing the Peppermint Foot Scrub on my feet in one word, I’ll call it blissful! As an added bonus, it even has a slight cooling sensation (which would be the menthol)! Basically, this stuff smells great, has a fun consistency, feels amazing, and cools your feet, to boot! 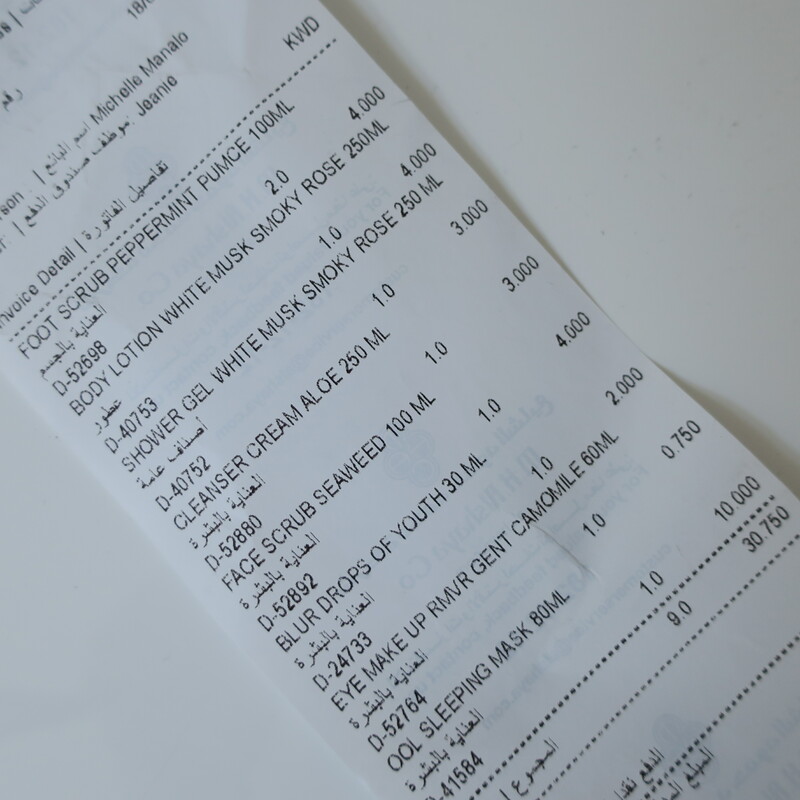 Instead of paying KD 50, I only had to pay KD 30/750 for everything, and ended up saving KD 19/250, which was pretty decent. I was seriously impressed with the Seaweed Pore-Cleansing Exfoliator and the Oils of Life Sleeping Cream especially! Literally obsessed with those two! Also, I’m so glad I got to replenish my stock of Peppermint Foot Scrub. That stuff is bomb! My body loves The Body Shop!